John grew up in Falmouth since 1972, and graduated from Falmouth High School in 1981. He earned a bachelor of science degree in accounting from The Ohio State University in 1987, but his own lumbar disc injury in 1990 and subsequent physical therapy treatment led him to a career change in 1992. 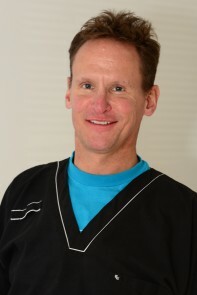 John graduated from the University of Delaware with a Master’s degree in physical therapy in 1996, after working at Falmouth Physical Therapy as P.T. aide from April 1992 until July 1994. He initially worked in Pennsylvania for the Lancaster Health Alliance for only five months, when he was invited to re-join the staff of Falmouth Physical Therapy. John has been practicing here since March 1997. John treats patients with many types of conditions, but enjoys working with the running athlete most. His specialty is lower extremity biomechanics and fabrication of custom foot orthotics, which are offered at a very affordable price. Video monitoring of gait and running on the treadmill is utilized to incorporate appropriate orthotic/exercise solutions. John learned much of his foot biomechanics knowledge through Irene McClay-Davis, P.T., Ph. D., at the University of Delaware, while his continuing education has focused on foot biomechanics and orthotics from Brian Hoke, P.T., S.C.S., of Virginia Beach, VA.
John’s interests include running, kayaking, skiing, hiking, model trains, music, and Buckeye Football!